SKB’s exclusive Perfect-Match™ valance bending system, providing tight, secure fits to prevent dirt, dust and moisture from getting inside the case. New TSA accepted and recognized locking latch system for safe and secure travel, allowing airport security to inspect case contents then conveniently re-lock latches. 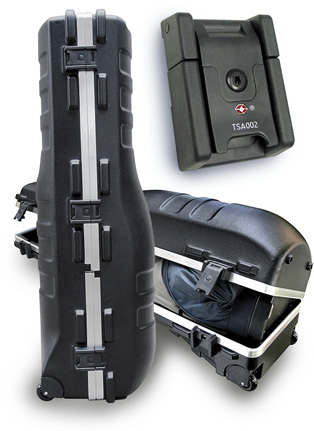 Molded-in Foot-Well helps you anchor the case while loading and unloading. New sculptured, form fitting case designs accommodate today’s popular standard and staff size golf bags. Inside Dimensions 48" X 12"
Inside Dimensions 48" X 14"
Inside Dimensions 49" X 16"